Copyright Holder: Original map data provided by The Atlas of Canada (4th Ed, p.87-88). Produced under licence from Her Majesty the Queen in Right of Canada, with permission of Natural Resources Canada. 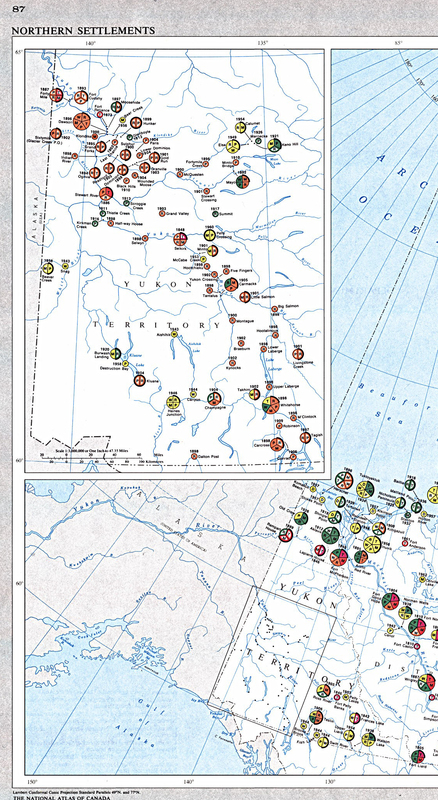 This map shows the chronology of selected facilities in settlements north of the 60th parallel. Selected facilities denoted include trading posts, missions, RCMP posts, post offices, weather stations and Distant Early Warning stations. Time periods in which the facilities were established as well as the operational status of these facilities as of 1965 is indicated. The legend is found on Image 3. Read more about trading posts - enter 'posts' or 'mail' in the search box to your left. Check the Beaver Index - e.g., 'posts, Arctic' 'DEW,' 'missions,' 'RCMP,' 'weather,' and 'mail' etc. In 1954, an Inuit who was noted for his unerring sense of direction, was hired as a guide for the military. On his first trip, using no landmarks or compass, he led a group of construction workers 200 kilometres across barren, treeless tundra with his dogteam. They reached their destination in two days. Later, a crew checking his trail by airplane found that at no time had he deviated more than four degrees off a straight course. Loosely excerpted from The DEW Line, by Michael Stephenson, published in The Beaver, Winter 1983.